The global market for active implantable medical devices is gaining remarkably from the increasing prevalence of several chronic diseases, such as cardiovascular and neurological disorders. The constant product launches, and simplified approval process is also supporting the growth of this market substantially. Going forward, the rising expenditure on healthcare, owing to the increasing number of patients with cardiovascular diseases and neurological disorders, is anticipated to fuel the demand for active implantable medical devices across the world over the next few years. However, the issues regarding the usage of active implantable medical devices, such as device failure and concerns related to cybersecurity may hinder the growth of the market in the near future. The global market for active implantable medical devices is likely to present an opportunity worth US$20.73 bn by 2025, expanding at a CAGR of 4.40% between 2017 and 2025. The global active implantable medical devices market is assessed on the basis of the product type, procedure, and the end user. Based on the product type, the market is classified into implantable cardioverter defibrillators (ICD), cardiac pacemaker, nerve stimulators, cochlear implants, ventricular assist devices (VAD), and insertable cardiac monitor (implantable monitoring devices). Among these, the demand for implantable cardioverter defibrillators (ICD) is greater at present and is expected to remain so over the next few years. However, insertable cardiac monitors are expected to register a robust rise in their demand in the near future, thanks to the increasing prevalence of cardiovascular diseases across the world. Based on the procedure, the market is categorized into cardiovascular implants, neurological implants, and hearing implants. By the end user, the market is divided into hospitals, ambulatory surgery centers, and specialty clinics. With significantly rising investments, the hospital sector is likely to emerge as the most prominent end user of active implantable medical devices in the years to come. Asia Pacific, Latin America, North America, Europe, and the Middle East Africa are the main geographical segments of the worldwide market for active implantable medical devices. With a share of more than 33%, North America dominated the global market in 2016, thanks to the technological advancements in developing novel active implantable devices. On account of the considerable presence of a number of implantable medical device manufacturers, such as Medtronic Plc, Boston Scientific Corp., and Abbott Laboratories, this regional market is anticipated to remain on the top over the forthcoming years. Europe, with a share of 28.4%, stood at the second position in 2016. It is expected to retain its position over the next few years, thanks to the frequent product launches. Asia Pacific, however, is projected to present the most promising growth opportunities to market players in the near future, owing to the remarkable rise in Asian economies, such as China, India, and South Korea, leading to increase in investments by implantable medical device manufacturers. Boston Scientific Corp., Abbott Laboratories, Medtronic Plc, Sonova Holding AG, LivaNova Plc, BIOTRONIK SE & Co. KG, Cochlear Ltd., William Demant Holding A/S, Nurotron Biotechnology Co. Ltd., and MED-EL Medical Electronics are some of the leading vendors of active implantable medical devices across the world. The market is demonstrating a highly competitive landscape and is expected remain intensely competitive over the forthcoming years. Active Implantable Medical Devices are medical implantable devices like cochlear implants, implantable defibrillators, Implantable cardiac monitoring devices, implantable nerve stimulators, ventricular assist devices (VAD) and implantable cardiac pacemakers primarily used to detect, monitor, avert, alleviate or treat disease or conditions in the patients. This report analyzes the current and future prospects of the active implantable medical devices market based on product, procedure, end user and geography. The research is a combination of primary and secondary research, conducted for understanding and arriving at trends, used to forecast the expected revenue of active implantable devices used in medical procedures in the near future. Primary research formed the bulk of our research efforts with information collected from in-depth interviews and discussions with a number of key industry experts and opinion leaders. Secondary research involved study of company websites, annual reports, press releases, investor presentations, analyst presentation and various international and national databases. The report provides estimated market size in terms of US$ Mn for product, procedure, end user, and geography for the period 2016 to 2025. The revenue generated from product type was calculated by considering the adoption rate of active medical implants across all geographies, number of product launched, average cost of products, trends in industry, and end user trends, among others. It comprises an elaborated executive summary, which includes market snapshot that provides information about various segments of the market. It also provides information and data analysis of the market with respect to market segments based on product, procedure, end user, and geography. The market overview section of the report analyzes market dynamics such as drivers, restraints and opportunities that influences the active implantable medical devices market in the current and future scenario. The report also provides Porter’s five force analysis that studies five factors and their impact on the active implantable medical devices market. Market share analysis among the market players is analyzed to signify the contribution of these players in the market in terms of percentage share. All these factors will help the market players to decide about the business strategies and plans to strengthen their positions in the global market. Based on geography, the market has been analyzed for major regions: North America, Europe, Latin America, Asia Pacific, and Middle East & Africa. The study also covers detailed country analysis contributing majorly in the active implantable medical devices market. The report also profiles the major players in the market and provides various attributes such as company overview, financial overview, product portfolio, business strategies, and recent developments. 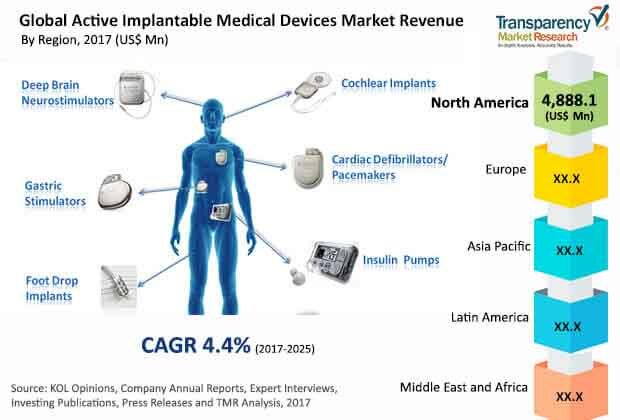 Major companies profiled in the active implantable medical devices market include Boston Scientific Corporation, Medtronic Plc., Abbott Laboratories, Sonova Holding AG, BIOTRONIK SE & Co. KG, LivaNova PLC, Cochlear Ltd., Nurotron Biotechnology Co. Ltd., William Demant Holding A/S and MED-EL Medical Electronics. Collaboration agreements was the primary strategy adopted by the major market players to enter into the active implantable medical devices.